On Monday, Apple changed the frontpage of their website to announce their next big thing. “Tomorrow is just another day. That you will never forget.” teased the “exciting announcement” on their website along with clocks citing world times – 10 am in New York and 7 am in California for those of us in the United States – and at that time came the most anti-climactic announcement since Steve Jobs returned to Apple, the Beatles have come to the iTunes store. We know Apple Computers has had legal problems with Apple Records for decades due to the similarity with their names. 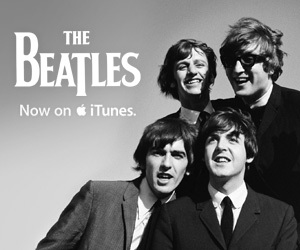 The Beatles (or at least their management) have been resistant to releasing their music in any digital format. We also know Steve Jobs is a big Beatles fan, so I’m sure it was a big announcement to him, but to the rest of us it was just a great amount of bluster for something most of us don’t care about. The Beatles released their definitive box sets in mono and stereo last year and anyone who purchased them could easily toss the cds into their computer, rip them and add them to their iTunes library. It may be easier to purchase digitally for those who want the music without the physical medium, but it’s hardly any sort of game changing announcement. The biggest guess prior to the real announcement leaking was that Apple was finally making use of the Lala service they purchased in December of last year. Lala was a service that would read your iTunes then allow you to listen to your iTunes library in the cloud, meaning you could listen any time and any place you had an internet connection. It was a fairly popular service until it shut down on May 31, 2010. At that point, people expected the Lala service, or something similar, to be rolled into iTunes eventually, allowing you to listen to your iTunes library anywhere on your iPhone or anywhere else you have internet connectivity. This still has yet to arrive. When companies are acquired, it is for either technology or talent. When Facebook bough the companies Drop.io and Hot Potato, both were to bring the people behind the technology of those services into their company to improve their products. The prior products of the companies are shut down and cease to exist. When it is a technology purchase, like when News Corp bought Myspace, it is to take the existing company to augment their own, which in the case of Myspace was to be able to market directly to the millions of members. The purchase of Lala was seen as a technology purchase, which we all thought we would see this fall with the release of iTunes 10. Instead we got the music social network known as Ping. Most people feel it was a broken system as released and nowhere up to Apple’s usual standards. Unfortunately we will just have to continue to wait to see if Apple roles out Lala for us next year or if the Lala buy out was to stop the service and acquire the talent. If you are a Beatles fan and are excited to be able to buy their music, then we’re all happy for you, but you are in the minority. Although if it was a major Apple announcement, they would have had the press come out tot he Moscone Center and have a Steve Jobs keynote announcing their major new launch/product/software/chocolate chip cookie. Is The Cell Phone Model Ready to Change?